Many thought the 21st century would witness political, economic and even ideological convergence amongst the countries of the West. This has not happened. Today we see America 'growing apart' from her democratic allies and neighbors. 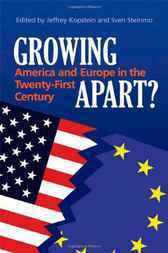 Growing Apart shows how the social, political, and economic forces shaping advanced democratic states are pushing America in different directions from the rest of the democratic world and argues that these changes are not the product of any particular president or government. This volume brings together a set of leading scholars who each examine the evolution of different social, political, and economic forces shaping Europe and America. It is the first book to unite the international relations scholarship on transatlantic relations with the comparative politics literature on the varieties of capitalism. Taken together, the essays in this volume address whether the 'West' will continue to remain a coherent entity in the 21st century. "The question of whether the United States and Europe will or even should remain closely allied is a critical and much debated one. Bringing together some of the most impressive scholars on both sides of the Atlantic, this book grapples with this question from a wide range of angles. It will be a ‘must-read’ for all concerned with U.S.-European relations, the ‘future of the West,’ and the way in which international and domestic factors interact to produce policy outcomes."